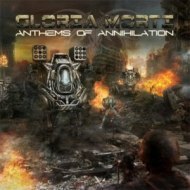 When Finland's GLORIA MORTI decided to name their new album "Anthems of Annihilation" it was not with tongues planted in cheeks. 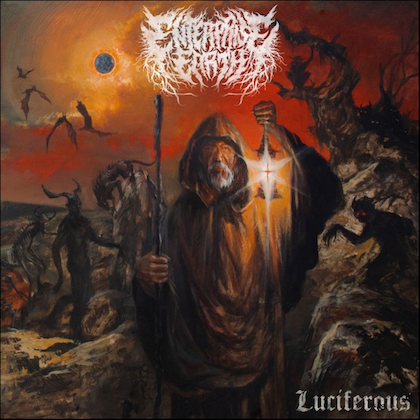 Annihilating describes quite suitably the a death/black metal approach that attacks in scorched earth fashion with blasting, double-bass power, yet displays an impressive melodic sensibility that is bolstered by moderately symphonic keyboard lines. The sounds of marching soldiers that opens the album ("Prelude") is the first indication, outside of the cover art, of the a lyrical theme described by the band as follows: "The storyline borders from a war between men and machines to the slavery and exploitation of a whole generation". Right, no tongues in cheeks. As "Prelude" builds, fears of impending world suicide begin to invade the psyche before an explosion of extinction-level magnitude occurs when the switched is flipped on "The Solution Called War". 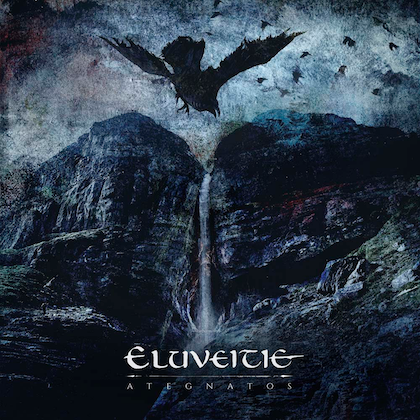 It sets the tone for an album awash in waves of ZYLKON-esque guitars and drumming from Kauko Kuusisalo that disorients and decimates, to a certain extent reminding of DIMMU BORGIR and BEHEMOTH. 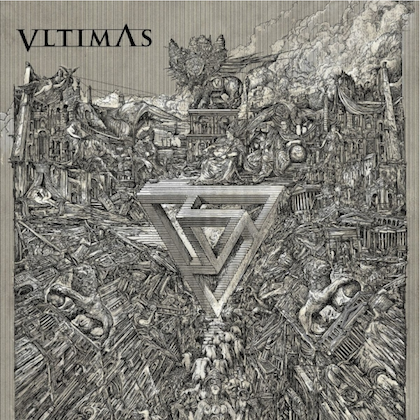 Whether a direct influence or mere comparison point, it is the tasteful use of keyboard melodies that is reminiscent of the former, albeit in less of an over the top symphonic sense. The keyboard arrangements of Lars Eikind (BEFORE THE DAWN bassist/vocalist) boost the impacting melody lines of songs like "Awakening of a Discordant Machine" and "Obey", while serving to set at tension-filled atmosphere during "Infiltration". The ZYKLON harshness alluded to above is pushed even further with the terrifying shrieks of vocalist Psycho that add a supplementary dynamic to his thick, commanding growls. The inclusion of bleak instrumental "Swallowed by Defeat" offers a kind of uneasy reprieve with its hypnotic cadence and cold, keyboard-driven melody. "Anthems of Annihilation" is destined to be one of those diamond-in-the-rough albums upon which we stumble from time to time. It is a powerful, well written album that is most worthy of your attention. I'm grateful it showed up for review, as I'm afraid I might not have otherwise been introduced to a band that is clearly on the rise.